Now in their 20th season, a small community theatre group in east central Illinois led by founder Robert Picklesimer, the Creative Dramatics Workshop, brings quality theatre experience to area residents. With a primary focus on growth and training of young people in theatre arts, those involved include parents of participants, as well as other adults who started as young company members themselves and choose to continue their involvement on stage and behind the scenes. 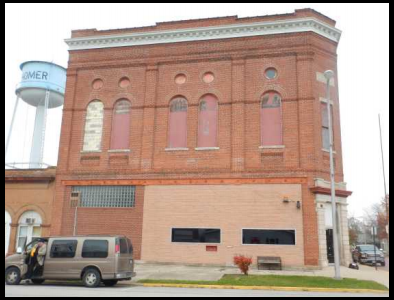 With some modest contributions, the group purchased the Homer Opera House in July, 2015, and are renovating the sound 1902 structure. TRANSITION The Creative Dramatics Workshop community theatre brings to Homer an evolved culture of family-friendly play-making and mentoring. Saving this grand opera house takes time, many hands, dollars, and good ideas. The plan is to focus first on making excellent community theatre here offering a limited slate of plays for an inaugural season in a facility under construction, renovate and expand programming as both income and community interest continues to grow, and build a business of rentals, using the building as a major asset, for sustained revenue. Those who find a ‘home’ here – whether in the theatre or as a partner – will enrich the community of and around Homer, Illinois.